Mijn conclusie: Boris Nemtsov is een fake liquidatie, de beste man is vissen en fishy. Nemtsov has not been assasinated in this fake attack in Moscow. There are various facts about what happened on February 27, leading to the conclusion the whole assasination is a strange event. I will not discuss again my previous blogs about the subject, presenting the same details of the fake assasination. 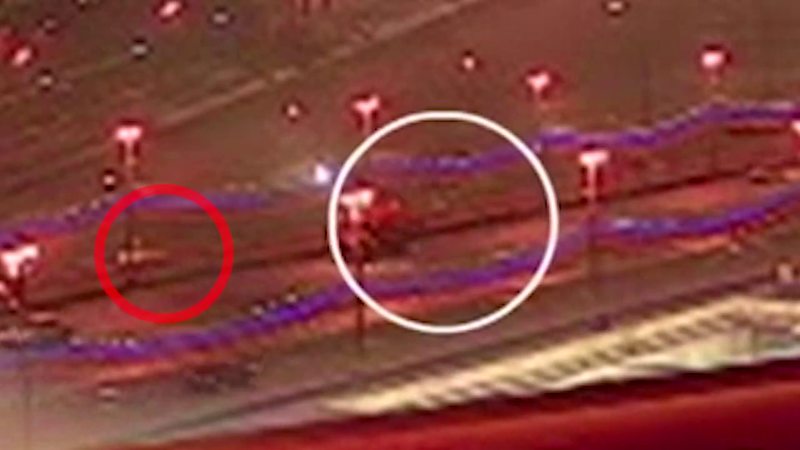 Here I will provide only proof: Boris Nemtsov can not have been shot on the Moscow bridge by the gunman at 23.31:15. Above you see two video’s. The first video has been presented to us in the media and shows the whole fake assasination event. The second video is a close-up around 23.31:15. The story does not add up, the moment the actual shooting is supposed to have happened. It takes at least 2 to 3 seconds, to shoot 5-8 bullets. The red circle in the pictures shows the stairs the officials story claims the gunman was coming from (no-one is coming from the stairs, the gunman presumably jumps of the snow wagon). The white circle highlights the gunman coming from behind the car. At 23.31:13 in the video, we see no gunman, a happily walking couple, and a snow wagon that is catching up with the couple (the wagon drives faster than they walk). At 23.31:14 in the video, the snow wagon stops, as the happily walking couple is catching up with the wagon the next second (they are visible at 15s). At 14s neither the gunman nor the couple is visible. The gunman likely jumps off the snow wagon at 14s. At 23.31:15, the snow wagon is standing still, as we see a glimpse of the couple walking forward in front of the wagon just before the white cirkel covers them up (and they are normally walking, it is seen at 1:06 and 1:54 in the 2nd video). This must have been the exact time Nemtsov should have been shot, as the person in the white coat is seen on the same spot a few seconds later, supposedly next to his body at 21s in the 1st video above. Next to the lamp post at 21s we see some additional dark ‘shades’ (left). At 23.31:16, the gunman is already visible behind the wagon, walking at least 1,5m on the car lane, with the snow wagon between him and Nemtsov. It is impossible for the gunman to shoot Nemtsov at 23.31:16s. The snow wagon is increasing speed again. At 23.31:17, the gunman is at least 3 or 4 metres onto the car lane walking towards the escape car. The snow/cleaning wagon is moving forward. At 23.31:21, the white coat is visible again, after the snow wagon has driven beyond the location of the socalled assasination. She is in the same spot as she was at 15s. Now, what do the media reports say? Someone heard at least 7/8 gunshots. They found 6 cartridges on the pavement, shot from a Makarov handgun. And Nemtsov was hit 4 times. Where in the timeline could Nemtsov have been shot? Only at exactly 23.31:15s, though this is a strech, because 1 second later the gunman was visible at least 1.5m on the car lane (and it takes 1 second to walk 1.5m, when you walk fast). Ask any expert: to shoot 6 to 8 bullets with a semi-automatic weapon, will at least take 2 to 3 seconds (for a trained professional). There is simply no time on the timeline (around 23.31:15) when Nemtsov could have been shot on the location they claim he has been shot. Impossible. It takes an extremely well-trained professional to even simply a) jump off a snow wagon, b) throw 6 bullet cartridges on the ground and c) walk away [all between 23.31:14s and 23.31:16s]. 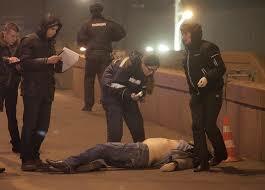 Conclusion: He has not been shot on February 27 at 23.31h on the bridge. How did they likely do it? Making a few assumptions, this is my best guess. They picked a location where the entire scene is caught on camera, yet the precise location of the body is not captured on camera. The gunman jumps of the wagon at 23.31:14s and drops 6 cartridges, perhaps playing a voicerecording of gun shots for the effect. The large wagon is in front of the “assasination” when he lies down. The escape wagon dims the headlights, to assure Nemtsov remains in the shadow for a few seconds. Likely Nemtsov had a capsule in his mouth with a drug, that makes him go into a coma. Nemtsov put on a skin-like corset somewhere that evening, which also has fake bullet holes. It allows him to breathe softly without it being noticed. As he is only seen in the evening street light, they can get away with it, if the police and CSI’s on the scene are in on it. This does require someone who stays with Nemtsov at all times, to make sure no-one just walks by and touches him (who is not part of the set-up). The first man on the scene (in the black coat) thus guarded Nemtsov and also likely dropped some blood, while the girlfriend is lured away by the snow wagon driver. The traffic is blocked to assure no witnesses drive by the scene, untill it is arranged. The press is allowed close to the body (distance of 3 metres), so Nemtsov is clearly on display and there are no doubts about him being actually dead. After studying all the evidence, I can do nothing else but bring this message, even though many readers are likely not prepared to believe this. To them I say: read the rest of my blogposts on Nemtsov and see if the official story makes more sense given the evidence. Why? Because there is a larger agenda at play. Soon, a world governance is supposed to come into existence, supported by police and secret agents who control society in every country worldwide. The recent attacks are meant to get the public support for this change. With Nemtsov dead, there is turmoilt created in Russia. Due to the above, only option 1 or 3 of the ‘who did it’ blogpost remain. Due to the fact that the attack requires involvement of many (city) state facilities, option 1 is most likely. Poetin must have known beforehand and likely doesnot mind, when een (small) opponent he considers a traitor is leaving. This entry was posted in international, NWO and tagged aanslag, assasination, Boris Nemtsov, coma, fake, false flag, hoax, Liquidatie, moscow, Moskou, nep, not dead. Bookmark the permalink. 2 Responses to Mijn conclusie: Boris Nemtsov is een fake liquidatie, de beste man is vissen en fishy. In dit interview genoeg quotes die het fantastisch doen als laatste steken onder water. Hij praat alsof ie voor de Amerikanen werkt, dus. Nu ja, we weten niet alles. Het hoeft ook niet. Ik heb je video 10 keer bekeken en telkens opnieuw. Er zijn geen 3 seconden te vinden waarin de moord gepleegd kan zijn. Als hij geschoten heeft vanachter op de truck (je hebt daar een vuilniswagen opstapje achterop) dan zou die vriendin ook eerder een kogel gehad hebben (een professional weet vooraf wie die wel/niet mag raken). Bovendien lopen ze er gewoon nog om 23.31 en 15 seconden. Het is echt te zien (je moet vaker stopzetten op exact dat moment, maar dan is er wel een foto te vinden). Wanneer vieren we Boris verjaardag en waar? Ik wil wodka met Boris de Boskabouter. Finding St Nemo. Hiding in the deepests of the seas.